A friend of mine called me today who wanted to talk about blogging. He was looking for advice on whether to get started blogging or not. We talked quite a bit about blogging but ultimately I left him with three thoughts that I feel are the most important for blogging. Are you blogging to attract clients, to attract distant cousins or to share your knowledge about a geographic region or a particular topic? If you are a professional genealogist, make sure your blog posts talk about types of projects that would attract your ideal type of client. When attracting distant cousins make sure you write about those ancestors that you might share in common. 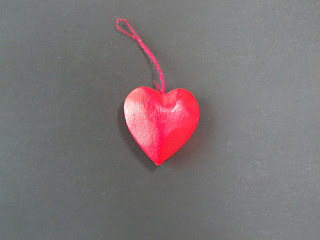 Your blog will become a labor if you don't write from your heart. Write about what truly interests you and inspires you. If you have to force yourself to write you will soon tire of blogging or at the very least will not enjoy the process and it will feel like work. Don't let yourself be influenced by other people when it comes to how you present your blog and what you write about. The one person determining your content should be you. Write about what feels comfortable. That goes for your writing style too. Don't feel that you need to write in a certain way or show a certain personality to attract readers. Just be true to yourself and review your goal every once in a while and hopefully it will all flow naturally. Boston University, home to the Certificate in Genealogical Research, is offering a new one-week writing program this summer called "Writing Family History Narratives and Other Genealogical Works." The course will be taught by Dr. John Philip Colletta and Dr. Thomas Wright Jones and will run from July 25-29, 2011. I caught up with Program Director, Melinde Lutz Byrne and asked her some questions about the new program. Why did you decide to create a writing course? Three big reasons - 1. Most students seem to be problem-solvers or writers, but not both. Since BU's certificate program addresses problem-solving in many modules, providing something to develop writing skills had potential to be in big demand. 2+3. John and Tom are two excellent instructors with different strengths, which will stretch students in both creative and technical directions. Is this class on-location or on-line? The writing course is contracted to be an onsite class. Is the class limited to a certain number of students? I understand that one day may be in a computer lab now, and the size of the lab BU provides will limit the overall number. Is the class almost sold out? I believe we had quite a few within minutes of the announcement at NERGC - but not knowing the current number or the capacity of the lab - let's just say there is lots of interest. Who would most benefit from this class? I think people who are deeply involved in research are sometimes 'way behind on writing up their results. If you don't cite as you go, you probably don't write as you go, either. Learning to put it down in an interesting, technically precise manner may improve not only writing skills but demonstrate big holes in research that looked complete when they're just a stack of notes. No matter what stage you're in with your research, it is not too soon (or too late) to focus on writing it up well. How should students prepare for this class? Probably the most valuable thing students should have in advance is some research experience in one or more problems. It will be most useful to have drafts, first efforts, and/or things in need of polishing. Although examples will be provided in the classroom, learning is most meaningful when it is tied to things you know and have personally struggled to solve. What should students expect of Boston at the end of July? How should they pack and should they expect any free time for activities such as catching a Red Sox game? July is always hot and sometimes quite humid. If students opt to stay in the dorms, it is more than half a mile to the campus buildings where most classes will be held, so comfortable shoes are a must. There is a green line subway on the surface that connects directly to downtown Boston and all the great dining, theater, museums, and parks are a short ride away. The Charles River is only a few blocks away, where there are jogging paths and picnic spots. Red Sox night games are great fun - the crowds are huge and Fenway Park is just a few blocks from campus. Getting tickets are another matter! Are the classrooms and the on-campus housing air conditioned? Yes, as far as I know we will have top notch accommodations. Do the students need to bring their own laptops or other equipment? Just about everyone comes to the onsite classes with a laptop anyway. These days it is pretty much assumed that you'll have one - there is little other way to do the assignments. What strengths does each instructor bring to the course? Dr. Jones comes from a strong education background with decades' worth of research experience and almost ten years of editorial red ink. His command of citation principles and evaluation techniques makes him a great communicator of genealogical writing excellence. Dr. Colletta is a master of expression who can paint a scene or set the stage in that strange foreign country called the past in a compelling way. Combining the two should make for an incredible class! This is the second course for the BU Genealogy Certificate program. Will there be other courses in the future? BU has not done a one week format previously and we are looking at this offering to judge if it will be a viable thing going forward. No plans are in place, but the alumnae of the certificate program have asked for several things and we always listen. I suspect an advanced forensic unit with Dr. Boyle and Dr. FitzPatrick would be in great demand. Pairing outstanding investigators who are also outstanding teachers has to make for great genealogical instruction, don't you agree? 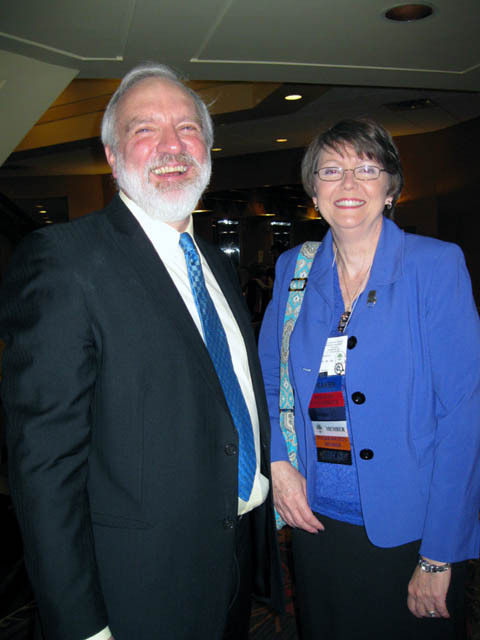 A fellow and president of the American Society of Genealogists, Melinde Lutz Byrne is one of only 50 living genealogists elected to the Society based on the quality and quantity of their published work. 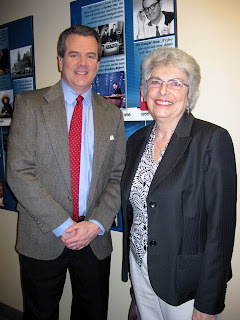 A cultural anthropologist and archivist, she is also vice president of the Massachusetts Genealogical Council, CEO of the Graceful Companies, and a Donald Lines Jacobus Award Winner. A national lecturer and noted author of numerous books, including volumes I and II of The Great Migration: Immigrants to New England, 1634-1635, Byrne is editor of the New Hampshire Genealogical Record and co-editor of the National Genealogical Society Quarterly. 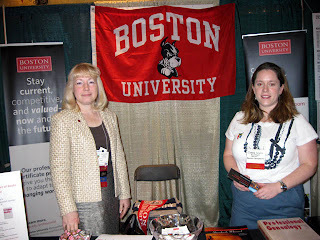 Photo Caption: Program Director Melinde Lutz Byrne with a Boston University staff member. I was speaking to a friend of mine who was interviewed about his family history by a journalist for a newspaper article. He was frustrated and confused because the part of the interview that he thought was the most interesting was not used by the reporter in the published interview. Speaking to a reporter for the first time can be a nerve-wracking experience. By gaining some understanding of what is going to happen and what the reporter wants, you can help reduce that anxiety. A major thing that can impact the interview is whether you have advance notice of the interview or not. Many interviews are scheduled ahead of time and that provides the interviewee with the ability to prepare. But some interviews can happen on the spot at events and can leave the interviewee feeling like they participated in a whirlwind. Here are some tips to help make both types of experiences better. 1) The Journalist who interviews you may not know anything about genealogy or family history. They have been sent to write a story or to cover an event by their supervisor. They need to cover the story and meet their deadline. 2) The journalist may not specialize in a field related genealogy, history or even liberal arts. I Googled a reporter who recently wrote an article about the New England Regional Genealogical Conference only to discover that he was a business reporter. 3) The reporter is looking for angle to write about. As they are listening to you speak they are trying to determine which aspect will make for the best story to meet the goal of their article. When publicizing and event, an interviewee's story may be a secondary example in the greater goal of providing information about the event. If the interviewee is the feature of the story they will be given greater in-depth attention. 4) Journalists, unless they are recording the interview, will inevitably forgot to jot something down or may write it down incorrectly. 1) Goals. Ask the reporter at the outset of the interview what their goal is and how you can help them. Some reporters may not know at the beginning what direction they want to go but by asking you may gain some valuable insight that will guide your answers..
2) Background Check. If you are participating in a scheduled interview, research the journalist ahead of time. Try to discover what topics they normally specialize in and what types of articles they write. This will help you understand how much they know about your topic and what they like to write about. This can be particularly useful in helping you understand when you are speaking to a journalist who isn't interested at all in your subject. 3) Prepare a Take-Away. I'm sure many genealogists have war stories about journalists who covered their stories and got it wrong. There's nothing worse for a genealogist than discovering that a journalist has contributed erroneous information to what will be used in the future as an archival document. One way to help combat this is to prepare a one-page summary of key names, dates and information. The journalist will be able to use this information when they sit down to write the article. This will ensure that the names are spelled correctly and the information is correct. 4) Don't Get Too Personal. Sometimes it's easy to get carried away if you having a great conversation. Be careful not to discuss personal information with the reporter that you don't want the world to know. You can say "This is off the record" but a much better solution is not to mention the information in the first place. 5) Provide Contact Information. Offer to give the journalist your name, email address and phone number in the event they want to "fact check" the interview. Don't hesitate to provide you phone number. If the journalist has a quick deadline turnaround they may prefer to call you rather than waiting for email. The more prestigious the publication the more likely that they will do a fact check. I have been interviewed a number times by journalists so many of these tips stem from my personal experience. While I have conducted many interviews, I am not a professional journalist. I would welcome additional thoughts on this topic from anyone who can provide that inside scoop from the journalist's point of view. Hopefully when you are contacted by a journalist you will be better armed for a smoother interview. Interviews are worth doing but they are even better when you can ensure their success. As many of you know, I recently returned from four days at the New England Regional Genealogical Conference. Over the course of three days I got to listen to some of the best genealogical speakers in the United States. While watching Craig Roberts Scott give a talk called "The Impact of Bounty Land on Migration Within and Out of New England," I realized that I could learn a thing or two from watching his style. Craig uses a very interactive technique with his audience. In a way it's almost like a teacher presenting to students except more fun. Craig asks the audience loads of questions during his talk. Sometimes he's looking for real answers and sometimes he's just being silly and having fun. But the effect is to keep the audience engaged and participating. Craig and keynote speaker, Paul Milner, shared a different interactive trait in common. Both speakers engaged the audience in a fifteen minute question and answer session BEFORE the sessions started. This allowed the speakers to build a rapport with the audience, get them engaged in the topic that was about to be discussed and allowed them to gage the audience's knowledge of the topic. I had never seen a speaker do a Q&A before a talk but I really liked it. 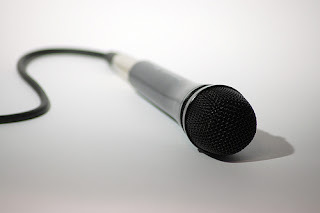 I quickly realized that one of the best ways to become a better speaker yourself is to watch other speakers, especially very experienced ones. From then on my attendance at talks was more focused on watching the speakers' presentation styles that it was on the content. For instance, Lucie Lewis showed skills as a seasoned story teller while interweaving the tale of a family history. I don't think I could become that kind of story teller but I can appreciate the technique and try to weave a little more storytelling into my talks. Pamela Boyer Sayre, on the other hand displayed an energetic, content filled presentation on writing that was engaging yet approachable and not overpowering. Intermixed with her very technical content were the occasional humorous examples. She did a great job balancing between providing important content and keeping the audience engaged. In the opening session D. Joshua Taylor did an amazing job of captivating, enlightening and engaging the audience. He makes public speaking look effortless. I'm just going to have to attribute his speaking ability to a natural gift. No one makes it look quite so easy as he does. During his talk on Federal Court Records, John Philip Coletta used repetition to help teach the audience exactly how to request the records themselves. With such a complicated topic, I found the technique to be very helpful. The Keynote speakers during their banquet talks really demonstrated their abilities to captivate an audience. Paul Milner displayed a flair for the dramatic that was unexpected and powerful. John Philip Coletta, meanwhile, educated his audience while being humorous and engaging in a good-natured banter with an otherwise potentially tough audience. The best place to watch other speakers is at a large regional or national conference. The speakers are providing their best performances at the larger venues. And the advantage for you is that you have the chance to see many different styles and techniques all in one place. So the next time you go to a conference, don't just listen to the content, learn from how the speakers are presenting. It will do wonders for your own speaking ability. 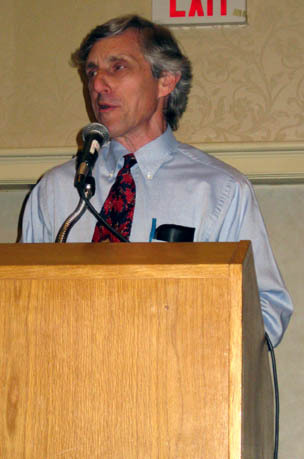 Top: John Philip Colletta giving the Saturday night banquet talk at the 11th New England Regional Genealogical Conference. Bottom: Speakers Paul Milner and Pamela Boyer Sayre. Ok, I admit there is no perfect conference. At least not on paper anyway. The conference organizers do they best they can to present offerings for all their attendees. But inevitably they always fall a bit short, at least with some people. But every conference can be nearly perfect and I'm going to reveal to you the secret how. At the New England Regional Genealogical Conference which I just attended, I met a woman named Maria at a banquet luncheon. Maria had a Portuguese background and was a little disappointed that there weren't any offerings for her particular ancestry. I told her not to worry because we had one of the best New England genealogical experts on the Portuguese right there at the conference - Ruy Cardoso, CG. Even though Portuguese research wasn't on the menu at this conference Maria was still able to talk to a Portuguese expert. Attendees at conferences include not only hobbyist genealogists but also many professional genealogists. If you find that the talks in the conference brochure don't meet your needs try these techniques to make the conference perfect anyway. At the New England Regional Genealogical Conference we have what they call an Ancestors Roadshow. I suspect that they have this at other conferences across the country. 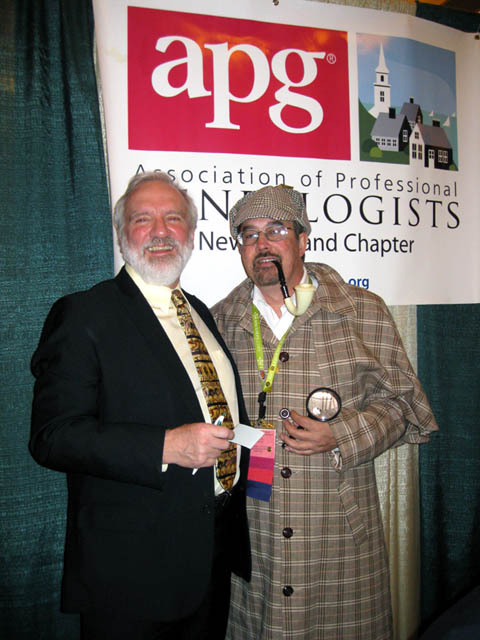 At a roadshow, conference attendees can have a private one-on-one consultation with a professional genealogist. This can give you new insight and direction for your genealogical challenges. To get the most out of a roadshow appointment come prepared. Have a specific question in mind to present to the professional. Also, be sure to provide them with a one-page summary of what you know and a list everything have already checked, including searches that turned up empty. 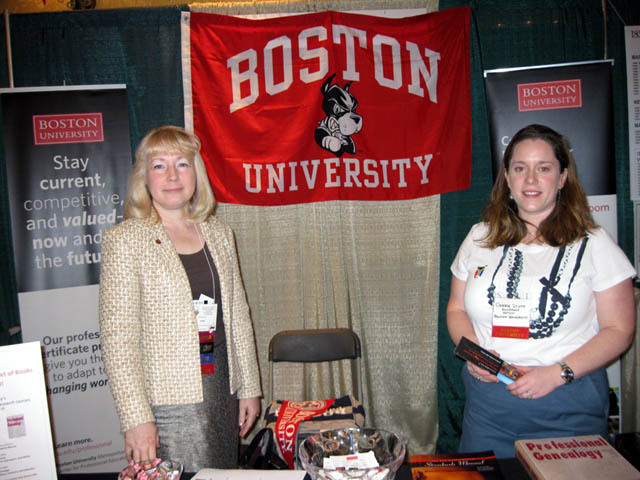 At many conference you will find booths in the exhibit hall for the Association of Professional Genealogists and for the Board for Certification of Genealogists. 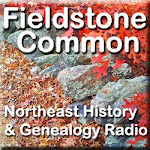 Both of these organizations are a good place to find genealogical experts. Stop by their booths and tell them what you are looking for. They will be able to let you know if someone who specializes in the area of your research need is attending the conference. They may be able to help you connect with that person. Lastly, the staff of the conference itself are a great resource. They are often familiar with all the speakers as well as professionals who are attending that are not speaking. Stop by the registration booth or the hospitality table and see if they can connect with someone with the right expertise or at least someone who will be able to tell you who you need to talk to. Making a conference a success is much more than just accepting the program that is printed in the conference brochure. By reaching out and talking to many new people at the conference you will have a much more fulfilling experience. And you will be enriched by connecting with folks with similar interests. So the next time you go to a conference don't leave your success up to the conference organizers. Take matters into your own hands and create your own success. You will never be disappointed! 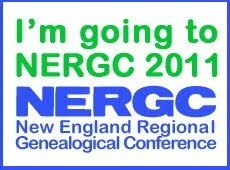 Tomorrow I am headed to the New England Regional Genealogical Conference (NERGC) in Springfield, Massachusetts. This is the largest, most dynamic genealogical event in New England. The conference is sponsored and supported by the efforts of 22 organizations across New England who come together to make it happen. If you love genealogy and you have a day or two or three free this week, then consider heading over to Springfield. If you can't get off work, consider coming for the day on Saturday. Don't have the money to spend on registration? Then stop by the Exhibit Hall or the Society Fair. They are both free and open to the public. If you pass me in the hall, be sure to stop and introduce yourself! I would love to meet you. 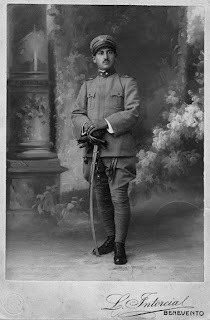 One of my Facebook friends is looking for help locating the grave of her Great Uncle, Palmieri Tavino. Name: Palmieri Tavino, born in Montorsi (a small section or "frazione" of Sant'Angelo a Cupolo), near the city of Benevento, Italy. Province: Campania. He was educated and proabably was an officer. 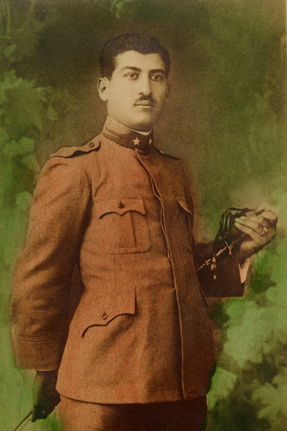 He was killed in action in the last days of the war, 1918. Buried in Austria. If you can help locate the gravesite or provide some helpful ideas, please leave your suggestions in the comments below. Any thoughts on his rank in the military based on his uniform would be greatly appreciated.